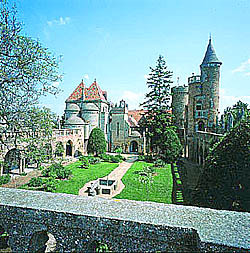 The region, which is homogeneous in its culture and rich in various natural beauties, is surrounded by the Danube and Lake Balaton and dominated by the Bakony hills. From the west, the region is bordered by Budapest, while in the north the Danube serves as a natural parting-line, which divides even a town, Komárom into two parts: the northern part belongs to Slovakia. On the two banks of the river 8 fortresses can be found altogether in the town including the 40,000m2 building complex of the Fortress of Monostor being an outstanding example of military architecture of modern times. Leaving the capital visitors can take the former Roman route going along the Danube or can even try water sports. In Dunaújváros you can go kayak-canoeing or rowing, while fishermen prefer the calm dead channels. Lake Velencei offers unique experiences for the lovers of swimming and sailing. In the north the region includes the Gerecse hills, the home of several rare bird species, and the Vértes hills, which bear the characteristics of a high mountain with their micro-climate, ravines and oak-forests. Going to the south, in Sárrét and Mezőföld you can see the typical landscape of the Great Hungarian Plain rarely broken by hills. 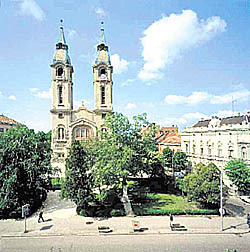 The centre of the former region is Székesfehérvár. The one-time coronation town has preserved its valuable buildings: the Cathedral, the Episcopal Palace, the Orb or the flower clock still attract many visitors. The landscape is more varied from the Balaton Highlands to Bakonyalja ( foot of the Bakony hills): the region is divided by the hills of Bakony leading to the Marcali-basin and the Small Plain. In Bakony the people used to earn their living by animal breeding and wood processing, but the steep ravines, the drain-traps and the caves served as shelters, as well, where highwaymen could hide away from the Turkish invaders. 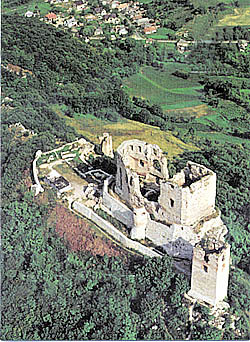 It is not by chance that a system of border castles was built here from Csókakő to Csesznek, but in peace-time the region offered noblemen hunting, as well, in the forests rich in deer. After the Turkish occupation Slovakian, Swabian and Serbian settlers arrived in the region. By now their culture has completely integrated into the Hungarian culture making it even richer. In the baroque devotional church of Péliföldszentkereszt the mass is given in several languages even today. The settlers have also contributed to the development of the industry here by establishing the famous porcelain factory of Herend or the glass works of Ajka. Apart from the economy, the cultural life has also developed: Veszprém and Pápa have become the intellectual centres with their schools. The former is also famous for its castle, the Fire tower, but the 13th century St. Gisela and St. George chapels are worth visiting, too. The region offers various cultural programmes to its visitors: the Baroque Days of Pápa, the Jazz Festival of Neszmély, the Castle Days of Sümeg or the Beethoven concerts in Martonvásár all represent this colourful region.